Eye On Sports Media: SI.Com Writer Did Not Know Where He Was Last Night? SI.Com Writer Did Not Know Where He Was Last Night? Athens, GA (Sept 28, 2008) - In 1996, there were many different collectible pins created for the Futbol (Soccer) venue for the Summer Olympic Games in Athens, Georgia. One of the more popular ones people wanted was the one that called the University of Georgia's football stadium "Stanford Stadium", and not the correct "Sanford Stadium" (see left). That mistake could be excused by the fact that World Cup games were played in Stanford Stadium at Stanford University in 1994. It would be hoped that a SI.COM writer that was physically present at last night's 41-30 dismantling of the Georgia Bulldogs by the Crimson Tide of Alabama would get the stadium name correct. Or he would at least make sure the web site editor would get the name right in the posted story of last night's game. But no, the picture caption included with Andy Staple's "The Long Kiss Goodnight for UGA" says the game took place at Samford Stadium. Now the error may be the fault of Getty Images, but if Sports Illustrated is going to market itself as a sports news site, it should get the facts right. It is all about credibility. 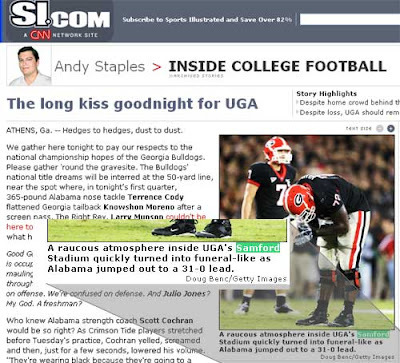 Andy Staple's "The Long Kiss Goodnight for UGA"
The error you blew up is a cutline. Cutlines are the responsibility of photographers and then editors. My guess is the SI.Com writer you're calling out in the post never even saw it, much less wrote it. Thanks for the comment and the explanation. But the cutline/caption are the most read part of a story besides the headline*, so it better be right, no matter who owns the responsibility. *See "A picture is worth a thousand words only if it's got a really good cutline, too!)" for an explanation.